Many of those consulted by Mr. Obasanjo are said to have signed on to his elaborate plan for a mass movement away from the ruling All Progressives Congress (APC), and his former party, the Peoples Democratic Party (PDP), to “rescue” the country. Mr. Obasanjo described the two parties as “wobbling” and unfit to run Nigeria. On Tuesday, the former president issued a scathing public commentary on the Buhari administration, advising the president to take a “deserved rest” and urging Nigerians to vote him out should Mr. Buhari insist on running. The Nigerian government on Wednesday responded to Mr. Obasanjo, outlining many achievements of the government. But there is an untold story to the public rebuke. Impeccable sources told PREMIUM TIMES the former president repatedly discussed his concerns with Mr. Buhari, and then decided to go public after he noticed no improvement in the way the country is governed. Frustrated by the worsening political and security situation of the country, Mr. Obasanjo spent the last few months consulting key political leaders in the country. He then used the better part of January drafting and editing what is now the explosive “special press statement” that has shaken the nation’s political foundation. Signs that things were amiss between Mr. Obasanjo and Mr. Buhari, a man the former endorsed for the presidency in 2015, manifested early this month in far away Oxford, United Kingdom. Giving a talk at the University of Oxford, Mr. Obasanjo commended some African leaders for their reforms and economic transformation, but left out Mr. Buhari. Asked from the audience on when he would make his feelings about the Buhari government public, Mr. Obasanjo said the time was not ripe. However, aides and associates of the former president said he had actually began expressing his misgivings about the Buhari administration from late last year, and shared his feelings with political associates and some elder statesmen. A number of those consulted, PREMIUM TIMES gathered, consented to Mr. Obasanjo’s idea that it was time to intervene in the political course of events. Mr. Obasanjo has held meetings with former Nigerian leaders, serving governors, lawmakers and other key leaders across the country before arriving at the decision. “At the last count, seven governors, 20 senators and over 100 House of Representatives members have agreed in principle with Baba to go into this coalition,” a close associate of the former president told our reporter. The personalities have chosen to remain in the shadows for now but have signaled their intention to move in to what is envisioned to be a mega coalition at some time. On his return to Nigeria from Oxford, Mr. Obasanjo commenced work in earnest on the press statement. He shared a draft with a few close aides and some of his children to get their comments. The former president was said to have made final edits on the document on the flight to and from Liberia for the inauguration of President George Weah. “Very early in the morning of Tuesday, Mr. Obasanjo called a meeting of about eight of his close aides and associates to finalise the document and what to do with it,” a source familiar with what transpired that morning told PREMIUM TIMES. Some of the former president’s children were said to have cautioned him about his personal security considering the tones of the letter. “Baba (Obasanjo) however told them that was the least of his concerns. He told them that he considers himself to be living on extra-time and was ready to pay whatever price for this country,” the source explained. The meeting then discussed the content of the statement and came to agreement that time was ripe for the document to be released. Mr. Obasanjo then directed that the statement be released to the media by email at 1pm, Tuesday. He also ordered for the final copy to be produced into a booklet. Initial 1000 copies were then produced. The octogenarian then picked up some copies of the booklets as he made for Ibadan later that morning. 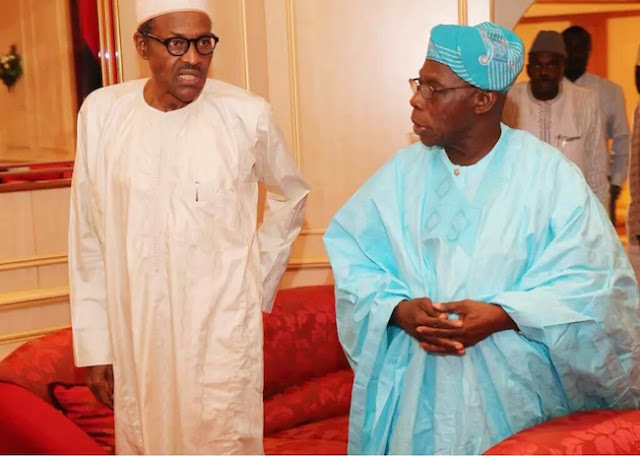 Mr. Obasanjo took a swipe at Mr. Buhari in the open letter, accusing the president of ineptitude, clannishness and callousness in handling affairs of the country. He described another term of four years for Mr. Buhari as “prison term” arguing that “Nigeria deserves and urgently needs better than what they have given or what we know they are capable of giving”. In the widely reported press statement, Mr. Obasanjo spelled out his concept of the movement. He said it would provide Nigerians a window to determine their fate and chart a new course for the country, away from the now dominant political parties. “This Coalition for Nigeria will be a Movement that will drive Nigeria up and forward,” the former president said. “It must have a pride of place for all Nigerians, particularly for our youth and our women. It is a coalition of hope for all Nigerians for speedy, quality and equal development, security, unity, prosperity and progress. It is a coalition to banish poverty, insecurity and despair. A discreet plan is said to be on afoot to constitute the leadership of the proposed Coalition for Nigeria movement, with announcement expected sometimes next week.